Lucky Lab Brewing happened to be across the street from the restaurant we had dinner reservations for, so this became brewery stop number 5 on the day. Needless to say, my memory is a bit hazy on this one. There was no seating at the bar - it was just a place to stand in line. Behind the bar was a lot of merchandise - t-shirts and the like. Seating was at wooden tables that gave me the impression of a high school cafeteria. All that combined, I wasn't a big fan of the atmosphere. We were served at the bar, and didn't get food. As we got the beer we ordered, I can't say too much about the service (I wasn't even the one who placed the order). Their website has over 40 beers listed, and I don't remember exactly how many they had available, but the list was well represented. The beer is great here - very tasty brews, innovative, and a wide range of styles. There were 10 house-brewed beers (including 3 IPAs!) as well as a few guest beers on our latest visit: Alt (Crazy Ludwigâ€™s), a Munich Helles (Hellesaurus Rex), the three IPAs (Super Dog, Triple Threat, and Rye), two stouts (Black Lab, and Wheat Stout on cask), a brown (Open Bridge), and a few others (Malt Bomb, Got Hops? and the guest beer, a red from Klamath Basic, and a cider). The atmosphere is great local pub - not at all formal, but all about a comfortable place to hang out. The space is an old wooden warehouse with an open ceiling with exposed rafters and beams and lots of skylights. Some of the walls are old unrefined wood and the rest are painted concrete. Part of the floor is made from very worn and warped wood; the rest is concrete. Wall sconces are made from cut up portions of aluminum kegs. Mix and match wooden tables fill the large room. 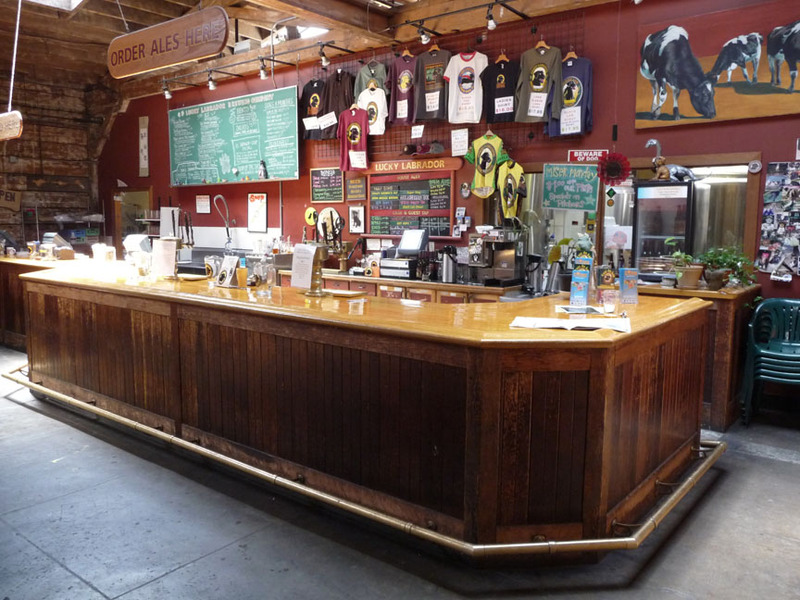 The wooden bar runs all along one side (no stools as this is where you order beer and food). 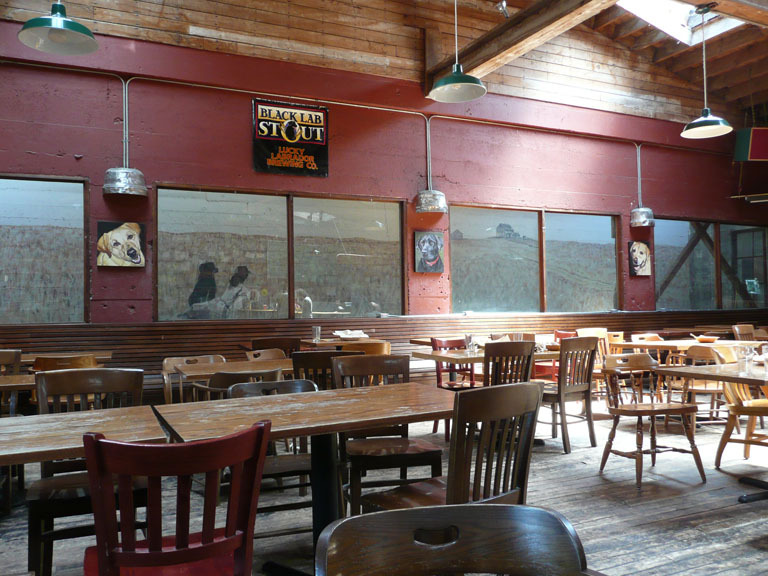 The brewery is visible through a couple windows behind the bar. The wall opposite the bar has a continuous curved wooden bench. Above the bench is a row of windows looking onto a mural painted on a concrete wall about six feet beyond the windows. Itâ€™s a takeoff on Andrew Wyethâ€™s painting â€œChristinaâ€™s Worldâ€: woman on the ground in a field looking towards a barn and farmhouse in the distance, but in this case sheâ€™s holding a beer glass and thereâ€™s a black lab seated at her side. The rest of the decor is also dog-themed: dog oil paintings, photos, newspaper and magazine articles, etc. 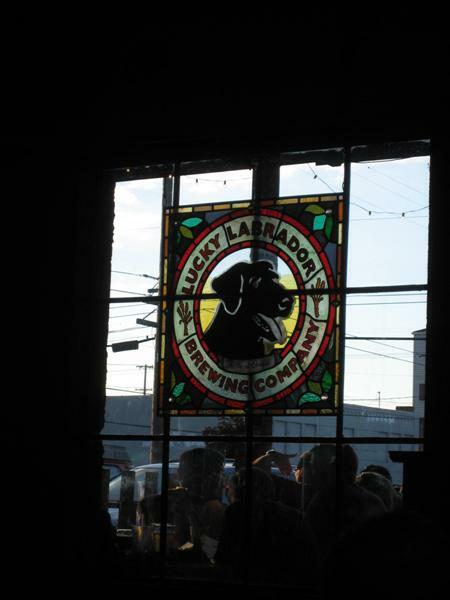 Thereâ€™s also a great Lucky Lab logo-ed stained glass pane hanging in the back window. 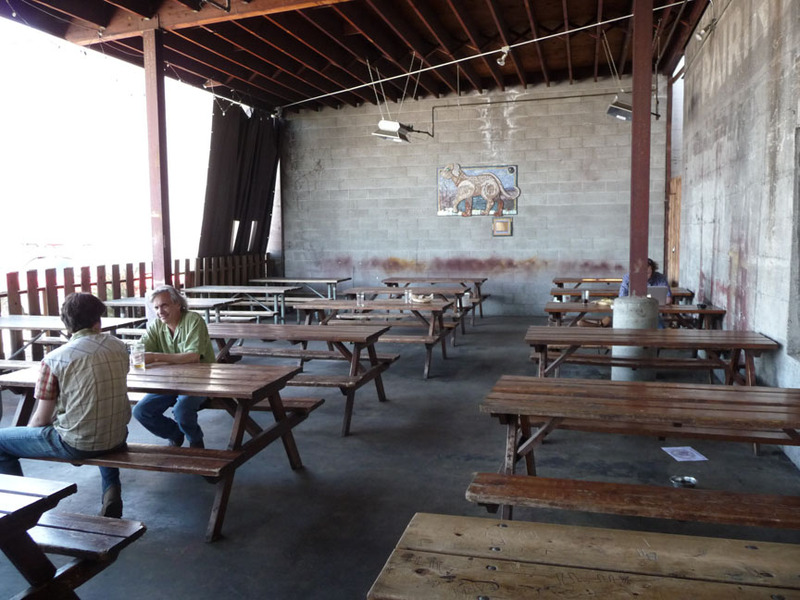 Outside in back is a large covered patio with many picnic tables. On top of the covered area is a series of solar panels. Parking is also available in back, nicely decorated with lots of flowers and tall hop plants. Food is soup, salad, sandwiches, and munchies (e.g., chips & salsa, potato chips). Itâ€™s not exciting but the quality is good. 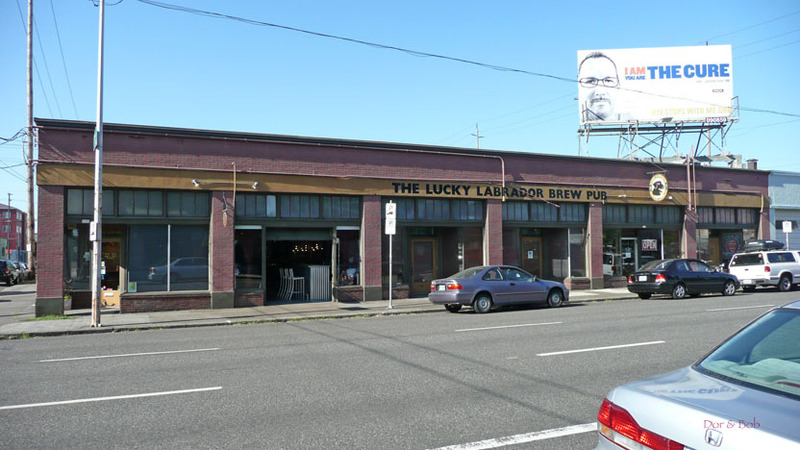 This is not an unbiased review: the Lucky Lab is my home away from home. Some of the beers aren't that great. The food could be better. The service could be faster (although chicken bento bowls or rice with sauce are handed to you on the spot). But the total package of relaxed atmosphere, imperial pints, nice dart area, and good enough beer and food all add up to create something greater than the sum of its parts. Beer best bets: Super Dog IPA, Crazy Ludwig's Alt, Hawthorne's Best Bitter. Some of the occasional IPAs are lovely: Super Duper Dog of course, but also Triple Threat or Summit IPA. Old Yeller barleywine is a treat. The Malt Bomb series is nice; some of the one-off lagers are tasty. My favorite Portland Brewpub! This place is how it all began. An open converted warehouse space with a meeting room, couple dart boards, and outdoor area for the dogs. They always have a great selection of their brews on tap. My favorite is the Superdog on Nitro. Holy hop! This beer is one of my top 10 favorite beers in the world. The food is deli style and delicous. A super chill, top quality beer hand out joint! 2006 Lucky Labrador Barley Wine & Big Beer Festival. I visited during this festival and had a great time. The festival brought me there I will be back due to the place was so much fun. An open space for everyone to be in. A few little side rooms but the big open space made it fell like an old time brew hall. Loved the brew and the food was awesome. Get some good Organic Oregon food while there. Try the pizza and the sandwiches where awesome. This place is a great find and a fun place to bring people to visit. You can brig your dogs to the outdoor patio sitting and kids are allowed also. Loved the hardwood floors and the NO Smoking was awesome!!! Woof Woof Lucky Lab. Top-Notch line up of house brews and an occasional guest. I personally like the Organic Golden the best but there are many great beers to choose from. Great food line up too (for a pub). Several vegetarian choices and great snack / appetizer choices. Veggie bento is nice and plenty of interesting sandwiches to choose from. Try Miser Monday to save a buck or three. Ultra-casual atmosphere so no need to get all gussied up. They have a couple dart boards in case you are so inclined. This Lucky Labrador feels a bit more structured than the other location. The dining/bar area is a bit less open, and the room feels less like a place where you are drinking in a garage. This is not necessarily a good or bad thing though, it just has a slightly different feel than the NW Beer Hall. There is a long bar with no stools where you will end up ordering your beers. Down the bar, closer to the front doors, you will find the area for placing food orders. Food will be brought out to you after you have ordered and paid your bill. There did not seem to be any wait staff going around from table to table, so the Lucky Lab seems to be a very casual serve yourself sort of environment. The beers I tried were great. They had a Simcoe IPA that happened to be one of my favorite beers of the trip. The sandwiches were good, but they were overshadowed heavily by the beer. 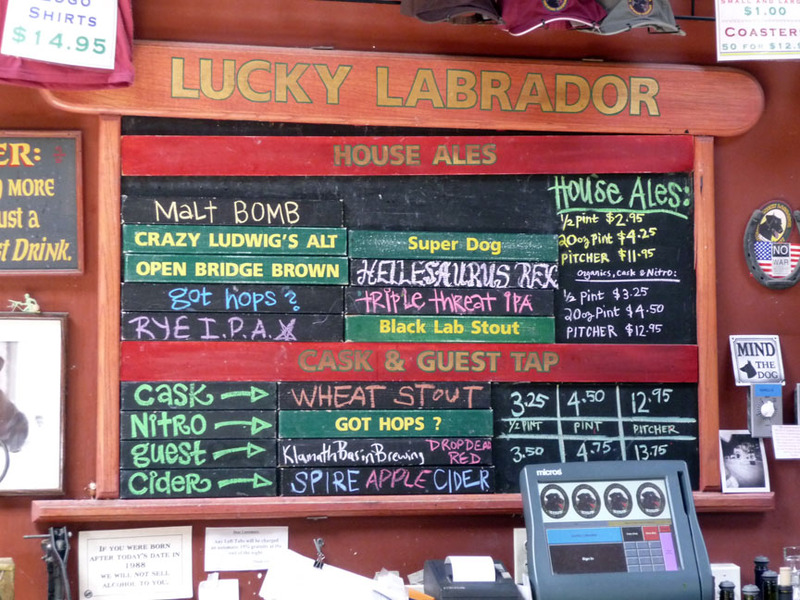 I would not make a special trip to the Lucky Labrador for their food, but a trip would be well worth it for the beer. They had a nice patio outside for enjoying beers in the breeze. Parking in this location looked to be mostly street parking and there are buses that run down Hawthorne regularly.